When I first started exploring the churches of East Anglia in the 1990s, it was the remote and hidden churches that enticed me the most. Anything more than half a mile from the nearest road was particularly favoured. But All Saints is so interesting and lovely that it would be worth seeking out whatever its setting. A track leaves the Capel St Mary to Great Wenham road by the fine Queen's Head pub, whose car park is a legitimate one for walkers, since you will clearly want to come back here for a pint or two of Adnams afterwards. A notice here tells you where you can get the key to the church. One key is at the pub, but be aware that it is closed on a Monday. Another is at Capel St Mary rectory, not far off. Past the bungalows the lane doglegs by some Victorian houses, and then meanders through farm buildings and fields before entering a curious fen-like area, over which it is a causeway.You do not need much imagination to detect the remains of a former settlement here. You then reach the extraordinary Little Wenham Hall, one of the oldest houses in England. The Hall was built in the 13th century, and its bricks are among the earliest known English ones (that is, they are not reused Roman bricks). The only other residential building in the parish now is the old Manor House, back on the Capel St Mary road, although when I came here in February 2013 I saw they were converting the magnificent 16th century red brick and timber barn opposite the church. The track curves around the grounds of the Hall, which are strictly private. It opens out into what is clearly an ancient farmyard, with All Saints on its mound to the right. All else about is gentle farmland. The difference in level between track and churchyard is so great that a flight of steps leads up to the gate, for all the world as if transferred here from a busy medieval street in Bristol or York. This churchyard is one of Suffolk's secret places. Few people know of it. Fewer still will have visited it. The graveyard still contains a large number of tombchests fenced in by 19th century iron railings; the unfortunate practice of removing these for recycling during the Second World War obviously never reached this place. Over the fence, there is a good view of the battlements of Little Wenham Hall. The red brick tower of the church stands high above the nave and churchyard. The buttress to the east of the porch contains no less than three mass dials in good condition, as well as the ancient gnomen of a sundial. The porch itself is a little 15th century wooden one, although it does have two features of great interest. Above the entrance, three image niches are set in the wood, in a way familiar from stone ones found elsewhere in Suffolk. Also, the entrance contains slots for a dropbar gate, existing elsewhere in Suffolk at Badley, a similarly remote church. Its purpose was probably to keep animals out.A notice on the door describes this as the church of St Lawrence, a locally popular dedication after such things were revived by the Victorians.But it was, and is still officially, All Saints. And so, you step inside. This is one of those churches which seduces the senses with its idiosyncratic character and plethora of interesting features. The first thing which will strike you is the great St Christopher facing the doorway. Although it has been damaged, the important parts are there, particularly the lush, curly hair of both figures. To your right are the remains of the medieval stone rood screen, existing elsewhere in Suffolk only at Bramford. Here, the top part was removed in the early 19th century, but you can still see where the reredoses for nave altars were set. And then, stepping through the gap, you stand before some of the loveliest wall paintings in all Suffolk. Because the church is pretty much all of a piece, apart from the later tower, having been built at the same time as the Hall in the middle of the 13th century, and because the original early Decorated east window is still in place, it is safe to assume that hese wall paintings are the original decorations, painted for the building's consecration. 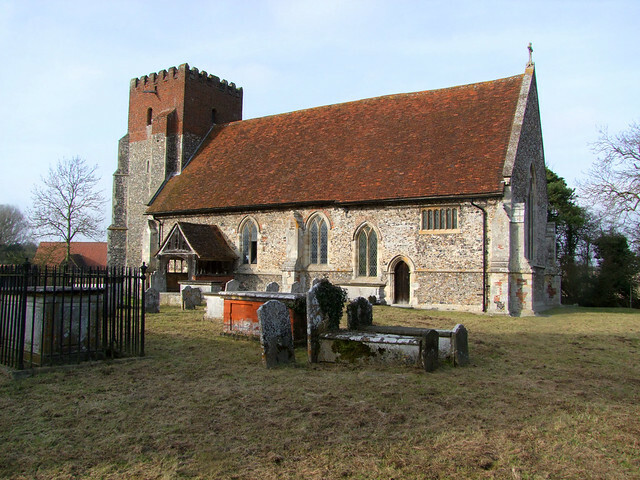 To the south, we see that ever popular Suffolk triumverate of female saints, Margaret, Catherine and Mary of Magdala. To the north of the east window, a rare survival, a Madonna and child, flanked by angels. The most striking thing about these beautful flowing figures is that the centuries have oxidised the skin tones quite black. They are exquisite. And, as if that were not enough, the chancel also contains one of Suffolk's best pre-Reformation brasses. It is on the floor in front of the altar, to Thomas Brewse of little Wenham Hall, who died in 1514. He and his wife stand stately and proud, confident in their position, and in the perpetuity in which Masses would be said for their souls. Her rosary beads hang boldly down in front of her; within 50 years, possession of them would be punishable by death. Beneath them, their children stand, boys to the left, girls to the right. The girls have long, flowing hair, which, Sam Mortlock tells me, means that they were unmarried at the time of their father's death. The Reformation would result in a different kind of memorial, where civil power could be legitimately expressed. The Brewses held the hall into the 18th century, and were patrons of this church. Either side of the altar are two other memorials to the Brewse family. 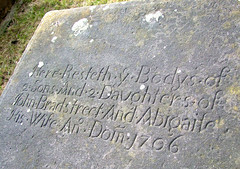 To the south, an extremely sentimental one to John Brewse, who died in 1585. At first sight, this is an extraordinary piece. And the longer you look at it, the more extraordinary it seems. The figure of Brewse is in outstanding condition, and outstandingly crafted. He kneels at prayer, a different kind of piety from his great grandfather on the chancel floor. He is in perfect proportion for a shorter man (which they generally were, in those days). He looks as if he might get up and walk away at any moment. The monument is decorated with all manner of heraldic shields, forming what is basically a family tree. To the north of the altar, what is plainly an Easter Sepulchre, and originally a pre-Reformation tomb for a member of the Brewse family (it bears an earlier form of the shield across the chancel) but for whom is now unknown. However, in 1785 it was pragmatically reused for John Brewse, a descendant of the other two. Another fascinating feature is the lovely 18th century Lord's Prayer on the north wall - it would originally have been at the east end. This is a church to contemplate at leisure, to immerse oneself in, and visit again and again. And yet, it almost didn't survive for us to see it. In the late 19th century, this church was quite derelict, and a decision was taken to demolish it. At the meeting held to discuss this, it is said that the Sexton swayed opinion by stating that "the old girl's been around such a long time, it seems a shame that she should fall down now." His eloquence led to its restoration, and a photograph of this hero can be seen to this day, beneath the tower arch.